Even if importing an old Access database to SQL Server is pretty easy using available tools, this might not always be the optimal solution. Linking an old Access mdp file to your SQL Server enables you to gradually move old legacy databases and systems to leverage the power and stability of a server database as you can leave the old dependencies untouch while implementing new ones to use the server. First thing to do is to get the Jet database drivers installed on the server. As Access first did not support 64 bit operating the drivers are not available out of the box. Don’t worry, you will not need to restart after installing this. Then go to Server Objects — Linked Servers — Providers and you should see the newly installed “Microsoft.ACE.OLEDB.120.0” driver. Open it’s properties and check both “Dynamic parameters” and “Allow inprocess”. Now you will avoid getting errors when trying to browse or access items in the database. setup a group with the accounts that need access to the database to give it full control over the folder. As a final touch before setting up the actual linked server you might need to take the time to define a SPN for the service account in cases when the database file is not on the same server as the SQL Server. Make sure to check that the settings on the Security page are has you want to have it. Then click on OK.
Now to make sure the linked server actually works, first open the context menu of the new linked server and select Test Connection. Then browse through the structure down to the tables to see if SQL Server is able to display you the objects in the database. If no errors are displayed the link is now ready and you can go and get your self your well deserved hot beverage. It’s been a while since I worked with Java and especially JDBC. Today I spent a while trying to get the Oracle BI Publisher to connect to a SQL Server 2005 instance. I found various examples of different ways to define the instance name in the connection string. After trying them all I could only conclude that defining the instance specific port number is the only way to get a connection established. Reading the MSDN documentation a bit closer also revealed that it is the recommended way. How do I know what the instance specific port number is? Easy! The port number needed is the item named TCP Dynamic Ports. Working with SQL Server CE 3.5 I noticed that it does not support the ISNULL function. Instead you have to use the COALESCE function to achive the same thing. The coalesce function can be used much in the same way as the isnull function. The coalesce function returns the first none-null value in the parameter list. For so many years I have been forced to work with Microsoft Access and application using it as a local and even shared network data storage, resulting in endless problems with corrupted and bloated database files. I was very pleased when I found out that Microsoft had finally introduced a good (and free) replacement for the light weight Access databases called SQL Server Compact Edition. 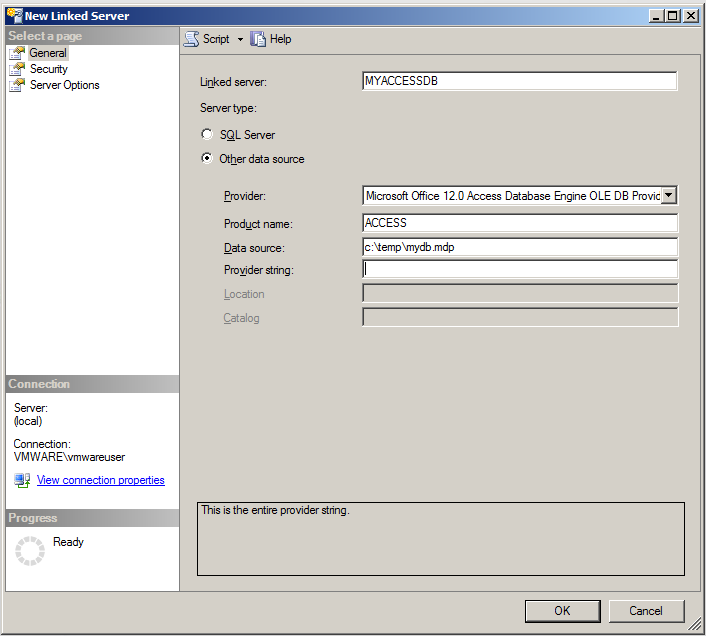 As Access it is a file based database but with many of the features of it’s big brother SQL Server. Finally testing the new database I quite quickly got more and more dissapointed, not at the database engine but the tools. When building on my first compact database using Visual Studio 2008 I almost immediately started getting errors like “The parameter is incorrect” and “The path is not of a legal form” for no particular reason. After googling for help I found out that the only solution is to restart Visual Studio, every time! Also the useability leaves much to hope for as now simple stuff like setting up relations and indexes requires switching between numerous dialogs. Hoping the SQL Server Management Studio would provide better tools I found out the old 2005 version does not support the latest 3.5 CE database. After installing the new 2008 version, I was not surprised to see the same tools and dialogs as in Visual Studio. I guess a visual tool for defining the schema is out of the question. I’m planning to use SQL Server Compact Edition in my next projects, hoping the engine will prove to compensate for the weak tools. You can be sure to read more about this subject in my later posts!